One of the advantages using wordpress self hosted as blogging platforms is, it allow us to easy customizing and adding addition features to our website. Plugins are available in the wordpress plugin directory that can be used to alter and add functionality or features of our website as needed. For you who want your wordpress blog works well, safer, more interesting / interactive, and preferred by search engine, you can use some best wordpress plugins to make it all. Well, the list below is the most popular and best wordpress plugins you have to install either it free or premium. Jetpack is an all-in-one plugin made by automatic team who also the main developer of wordpress. This plugin is used to add some features in wordpress.com blog that is not installed in wordpress self hosted site. By using this plugin, you can manage and write posts via wordpress.com account. You also can interact and follow each other with wordpress.com users, as if we were using wordpress.com blogs. So, this plugin integrate our self hosted wordpress blog to wordpress.com network. There are many features available in this plugin you can activated or deactivated, such as like and share button to social media, Automatically share your new posts to Social medias, site statistics, subscriptions via email, portfolio post type, contact form, CSS editing, and many more. I highly recommend this plugin to be installed on your blog. Trust me, it very useful. WordPress SEO by Yoast is a plugin to help you optimize the performance and appearance of your site in search engines, such as google, bing, and yahoo. Many people say that wordpress seo plugin by Yoast SEO is the best free plugins for SEO category. I am agree with that. This plugin allows you to specify the title and meta of each page and post, tell you how well the SEO of your posts, Edit .htaccess and robots.txt, create a XML sitemap, and much more. Almost all of on-page SEO techniques you can do easily with this plugin, especially if you are using a paid version of it. Plugin cache optimization and utilization W3 total cache maximize the utilization of cache on your website in order to make faster your website and efficient your server bandwidth. Besides optimizing the cache, this plugin can also be used to compress code. Using this plugin will make your blog more quickly and thus more desirable by visitors and search engines. Autoptimize is not as complete as w3 total cache. But, this plugin give very large effect on the website speed. This plugin is arguably more “aggressive”, because sometimes make some JS / CSS is not working. So, use this plugin with caution. Plugin to compress images This plugin is still to optimize and speed up your website. Wp Smush it is a plugin to compress and optimize image in your website so it can be loaded faster without damaging the quality. Every image uploaded, it will automatically optimized by this plugin. For the images that have been uploaded before this plugin installed, you can compress them manually on ‘bulk Smush it’ page (Media> Bulk Smush it). Spam filter plugin Akismet is a default plugin that already uploaded automatically when you install wordpress CMS. Just like jecpack, Akismet developed by Automattic team. If you install the jetpack too, akismet will become part of jecpack. Akismet is a plugin to filter spams that submitted through comments. The accuracy is very high. Akismet can detect bots comment and considering comments as spam if that contain at least 2 outbound links. When it installed, you have to enter the Fire Key to use that. You can get the Fire key by creating an Akismet Account first. So, before use that, you have to integrate your blog to Akismet account. Optimization Plugin database WP Optimize is a wordpress plugin to optimize the use of database on your wordpress site. This plugin works by cleaning unimportant data in the database that generated automatically, such as comment spam, auto draft, post revisions and so on. This plugin will help you to save your blog database source. To optimize your database you can do it manually by clicking the “Process” in the WP-Optimize Page or by scheduling database optimization automatically. Plugin checker broken links Broken link leads the visitor to a page that does not exist or has been removed, either because of wrong url spelling or because the URL is not updated. Broken links are risk your website user experience and SEO. The number of broken links on your website can cause decreasing to your search engines ranks significantly. Therefore, you should frequently check if there are any broken links on your website. By using this broken link checker, you can find broken links on your blog and fix it by changing the URL, Unlink, or remove it. Plugin security iThemes Security is a plugin for your wordpress site security from attack by hackers or people who are trying to sneak to cpanel or admin page of your website. iThemes security helps you secure your blog from brute force, SQL injection, Shell, DDos, and much more. In addition to secure from hacker attacks, this plugin can also be used to backup database and files on your website. This plugin is quite aggressive, so the excessive consumption can affect the performance of your website. Regenerate Thumbnails is a plugin to creating thumbnails for each image uploaded via media file in your wordpress blog. Actually, this plugin is only works when there is a new change of theme, or when you edit theme by adding new thumbnail size. By default, image that uploaded in your blog will automatically duplicated to cropped or resized thumbnail images, based of thumbnail configuration in wordpress theme used. Unfortunately, every wordpress theme usually has different thumbnail sizes. So, when you change your blog theme, thumbnail images used in old theme will not be comply with the new theme. Well, regenerate thumbnails can help you create new thumbnail image according to the size of new theme. Plugin for table of contents WP sitemap page is a plugin to create a human sitemap on your blog. Thus, the generated sitemap can also called as table of contents of your website. Sitemap generated by this plugin can shown by shortcodes provided in any page of site. This plugin is simple, but it is very good and recommended to make your website user-friendly. However, the premium is always better than free. Well, the list below are some of the best paid plugins may you need. 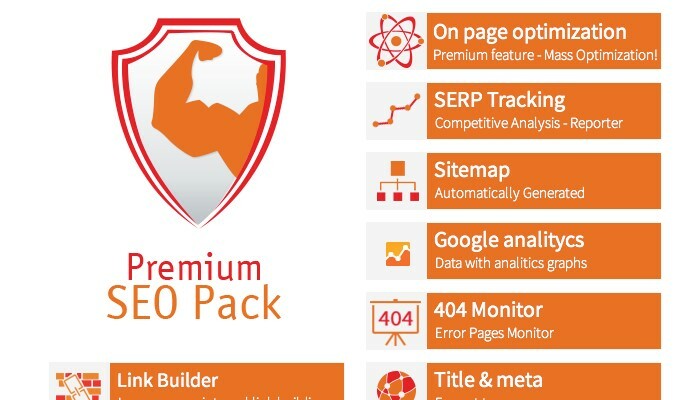 Everything related to SEO, you can optimize with this plugin. Not only for onpage SEO, you also can use this plugin to help your link building. This plugin has a lot of features, and it’s growing every updates. Some of the most powerful features of this plugin is: Mass Optimization, SERP tracking, Link Builder, Local SEO, Video Sitemap, validators, and much more. You should know that this plugin is the most popular SEO plugins in codecanyon. So, there are no reason to doubt about its quality. If you have a lot of blogs to be optimized in the search engines, this plugin is highly recommended to facilitate you optimize your wordpress blogs. If you want to make every page and post on your wordpress site has different look , you can use visual composer. This plugin allows you to create page on your wordpress site with just a click, drag & drop. There are more than 40 elements of content that you can use to create interactive pages, and it’s growing every updates. Every element available in this visual composer has an attractive and unique design. This plugin is perfect for affiliate marketer or anyone who needs landing page for his business. This plugin is one of the most popular wordpress plugins with 55000+ sales and has 4.7 star rate of 4000+ rate. Blog post from facebook and twitter If your business is more dominant in social media, and you do not have time to create content on your blog, you can use this plugin. 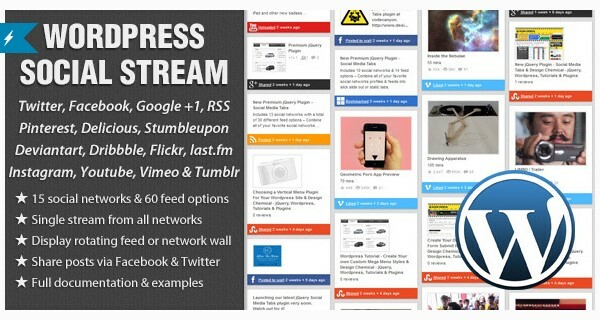 WordPress plugin social stream grab and publish your contents on social media to your wordpress website automatically as posts. There are more than 15 social media available, with 60 choices of content feeds that you can grab and publish it to your blog. It is including facebook, twitter, google + and youtube. All your status on social media, along with its images and videos may appear automatically on your website. Plugin share content As the name suggests, Easy Social share buttons is wordpress plugins to facilitate your visitors to share your contents to social media. This plugin is perfect for you who focus in viral marketing through social media to growing your blogs. There are 20 social networking available with various types of buttons. the most popular and best wordpress plugins you have to install either it free or premium.There are also available a lot and unique design. You can also put it in 12 most effective share location with drag-drop feature. Besides share button, you also can see the metrics and analytics in variety of social media to evaluate your viral marketing. That’s 15 wordpress plugins that recommended to you. You should not use it all, but use that really suits your needs. Do you have any opinion for this list? If you have any other recommendations, say it in the comments! Hope it will useful. Which is Better ? Blogger/Blogspot or WordPress ?